Gluten Free & Keto Chocolate Chip Cookies - just 1.5g net carb! 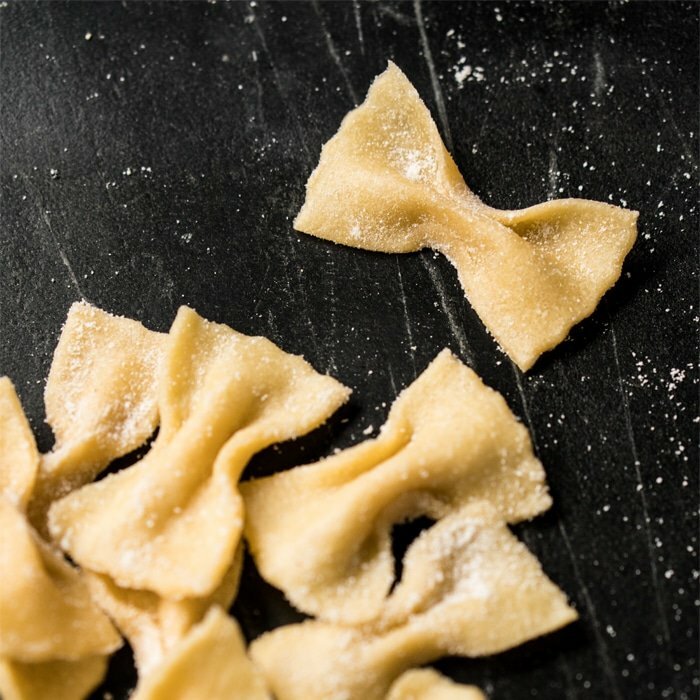 Chewy, lightly crisp and customizable to your taste buds! These gluten free and keto chocolate chip cookies are utterly amazing and just 1.5g net carbs a pop (i.e. the ideal low carb dessert!). Note: the recipe was first published on Dec 2nd, 2017 and has since been updated with more deets ‘n tricks. Bakery Style: Crisp & Chewy! I must start of by saying that these keto chocolate chip cookies are top 5 of our favorite desserts, all time. And if you consider the amount of baking that goes into a food blog, that’s saying a lot. But fact is, we’re total cookie snobs, and a lot of work went into getting these guys just right. And at 1.5g net carbs, let’s just say we’re fairly in love with the macros. But what exactly do we mean by just right? 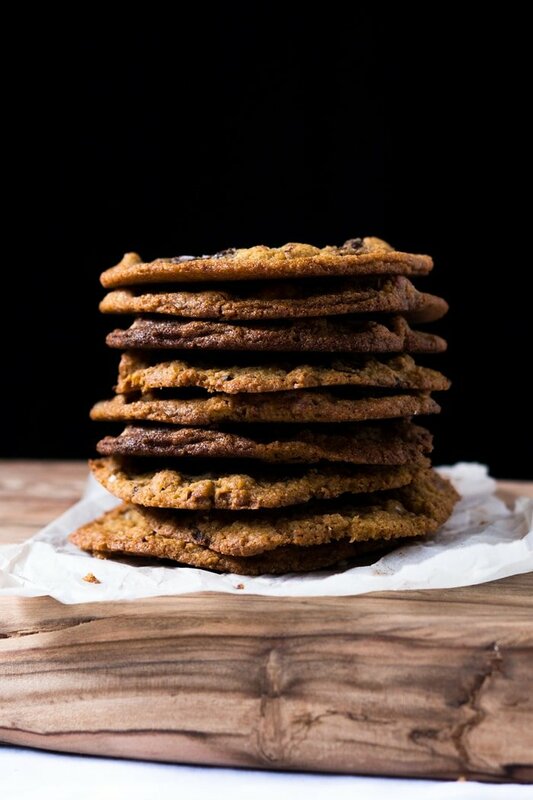 After all, chocolate chip cookies vary a lot. Some are crunchy all over, others are cackey, round, flat, spreadable… i.e. you’ve got options. Also, if you go through the comments (and the pictures tagged on instagram and Pinterest! ), you’ll notice that these cookies might well be called the ‘cookies with 1k looks’. For some of you they have come out cakier, lighter, darker… in all honesty this is normal for all cookies (as even the tray level placement in the oven can give you a totally different texture!). 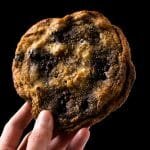 But it seems that normal cookie rules are aggravated in keto cookies due to the vast difference in ingredients from brand to brand. So here are a few rules to help you get the cookies you want. Be it crispier, chewier, cakier… you name it! For best texture. The cookies originally had a tablespoon of arrowroot added for extra tenderness and best overall bite, but I’ve since discovered that konjac powder (i.e. glucomannan) gives you the same results for zero carbs (this is the stuff your miracle noodles are made out of!). But you can always just use more coconut flour. Cream the butter until light and fluffy. This is a big thing in cookies guys (i.e. the golden rule!) , and there’s no workaround! For best texture you want to cream your butter and the sweetener with your mixer for roughly 10 minutes, scrapping the bowl 2-3 times to ensure no uneven streaks remain. I like them crisp. Use an erythritol sweetener for sure, as it’s the only one that will crisp up properly. Other than that, you’ll want pre-flatten your cookies quite a bit prior to baking and use parchment paper. For extra crispness you can even try placing your tray in the upper part of your oven and increasing temp by 10 degrees (the extra heat will spread them faster = crispier cookies!). And do note that erythritol can take up to a couple hours to crisp up completely. I like them soft ‘n cakey. Adding some xylitol to the mix (think 3 parts erythritol: 2 parts xylitol) can really help a bunch. 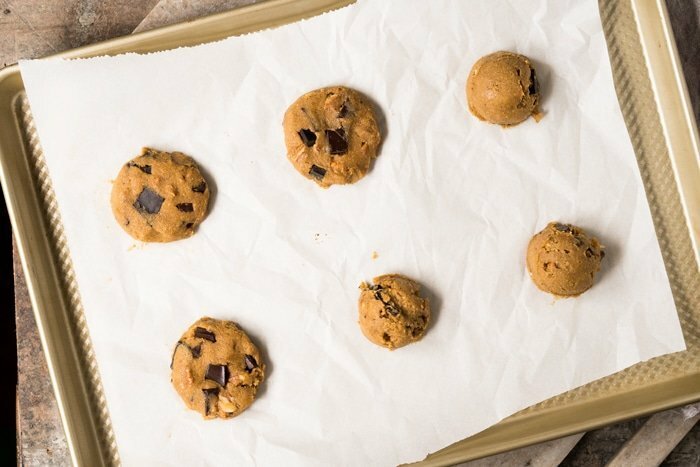 Other than that just don’t pre-flatten the cookie dough as much, you can bake on parchment or a baking mat, and be sure to place your rack in the middle oven. And, for extra extra cakey-ness you can even decrease the amount of butter by 10-20g. Note: convection ovens also lead to cakier cookies overall. How sweet?! 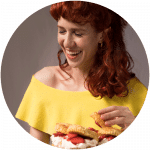 In case you haven’t noticed, keto palates in regards to sweetness are all over the place (I feel mine fluctuates constantly still!). So I’m giving you guys a range of 110-140g (7-9TBS) of sweetener… which is already less than the average 200g in your usual cookies! Whatever you decide. just don’t forget a light sprinkle of flakey sea salt on top, it’ll cut through the chocolate and sweetness beautifully. Oh, and did I mention you can whip up a double chocolate version of these guys too?! We like a mixture of super fine almond flour, coconut flour and (a very small touch) of konjac powder (i.e. glucomannan) for best crumb and bite. Add a touch of xanthan gum, and we’re golden. What is konjac powder (i.e. glucomannan)? Short answer, it’s a great substitute to cornstarch for both thickening up sauces and gravy. And it also lends a nice chew and crunch to keto cookies, which you simply don’t get from either almond or coconut flour. And, as mentioned, it’s the stuff your miracle noodles (shirataki) are made out of! 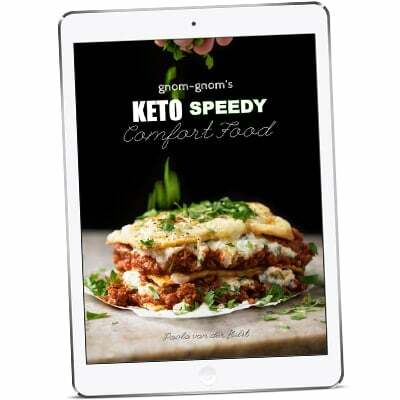 It’s cool stuff, and a must-have in your keto pantry. Can I sub out the konjac? Yes, you can do arrowroot (closest) or even just more coconut. The taste was just as good with all three. 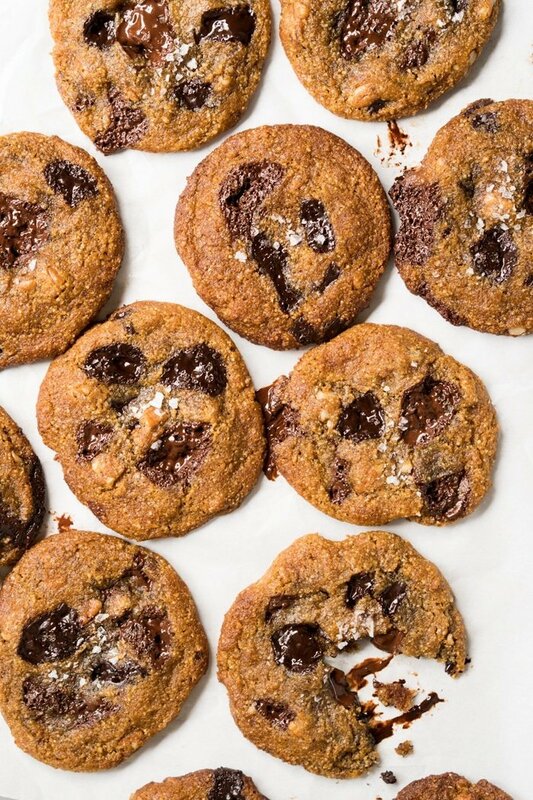 Perhaps surprisingly, getting the sweetener right for these keto chocolate chip cookies is even more important than the flours. And this recipe works best with erythritol sweeteners, without a doubt. Not only is it roughly 1-to-1 in sweetness to sugar (and the volume is important here), but it lends a very similar crunch and chew. No other sweetener did that. My current favorite for these keto chocolate chip cookies? Lakanto’s golden (tastes and smells sooo good!). I also like to add a (optional!) teaspoon of blackstrap molasses for that extra brown sugar kick. 1 teaspoon (7g) adds 5g net carbs (depending on your macros, very little effect on carbs/serving). But carbs aside, blackstrap molasses is a nutritional powerhouse rich in vital vitamins and minerals, such as iron, calcium, magnesium, vitamin B6, and selenium. But feel free to leave it out, just expect paler cookies. Your second-best option here is xylitol (same amounts). The issue here is that once melted, xylitol takes a while to harden up (roughly 12 hours!). 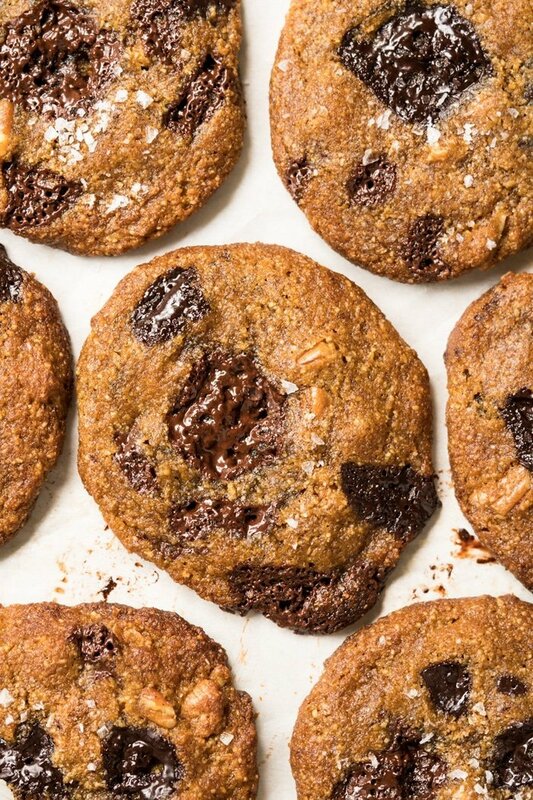 So you’ll have very chewy and fragile cookies until the day after. Taste is equally delicious, but texture wasn’t spot-on as you don’t really get a crunch (see picture below). 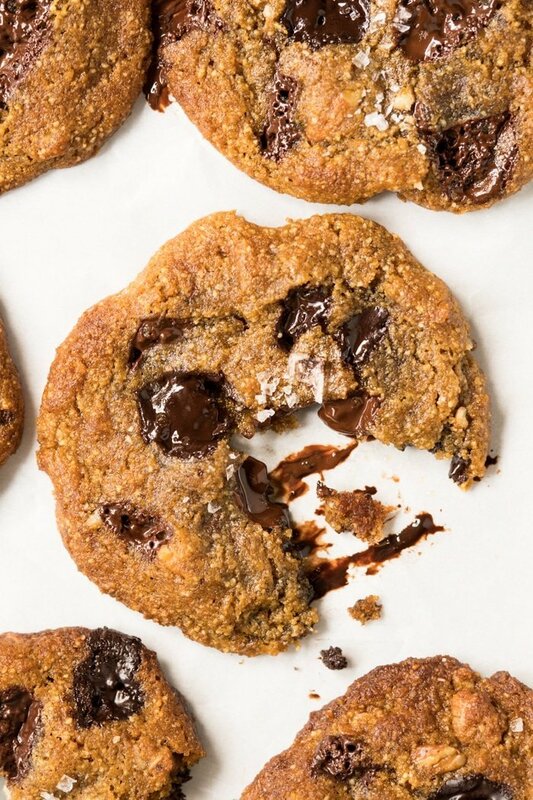 Call us weird, but we don’t like chocolate chips in our chocolate chip cookies. What we like, is an actual chocolate bar broken up into bits. You see, chocolate chips were designed to not melt completely. 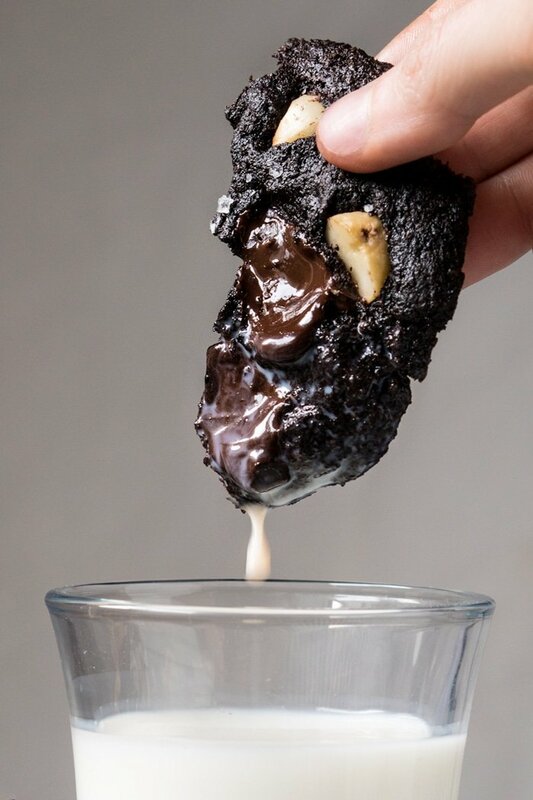 And we’re all about those chocolate bits melting throughout the cookies. So we suggest simply breaking up a chocolate bar into bits. 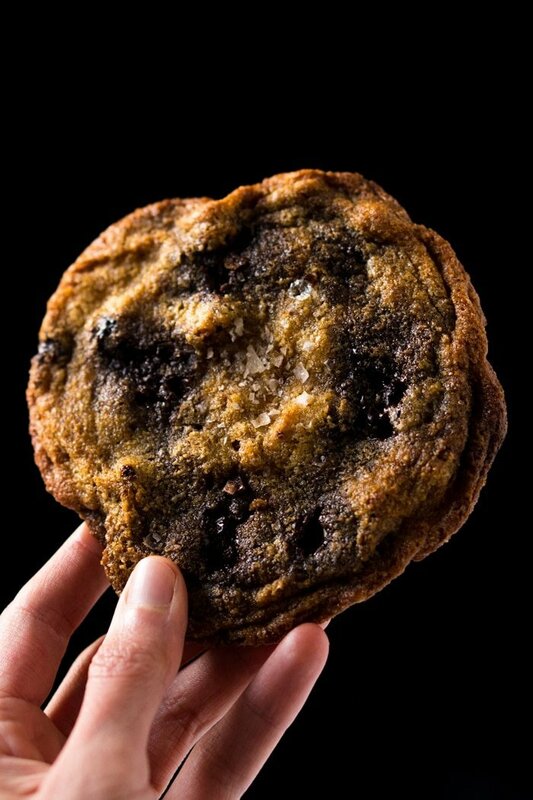 Don’t chop it up with a knife, or you’ll end up with powder and flakes which will make your cookies cloudy. But in the end, just use whatever your taste buds desire (and Lily’s does make awesome sugar free chocolate chips too!). Please see video for reference, tips 'n tricks! It's for the double chocolate version, but honestly same difference (just without the cocoa & slightly different ratios!). Add almond flour, coconut flour, konjac powder (or arrowroot/more coconut flour), salt, baking soda and xanthan gum to a medium bowl. Whisk until thoroughly combined and set aside. Cream butter in a large bowl with an electric mixer until softened, 1-2 minutes. Add in sweetener and molasses (optional), and continue to cream until light and fluffy (about 8 minutes). Fold in chocolate and pecan bits. Cover with cling film and refrigerate for 1 hour. Preheat oven to 350°F/180°C and line a baking tray with parchment paper (if you use a silpat baking mat they won't spread much, if at all). Divide cookie dough into 18 rounds for 3 1/2-inch cookies (or 12 for jumbo style! ), and flatten them slightly. The cookies will spread somewhat during baking, but you still need to pre-shape them slightly (i.e. the more you pre-flatten them the more they'll spread = crispier cookies, so if you like them cakier just don't flatten them too much!). Place cookie dough on the prepared baking tray (or freeze, see notes). Bake for 9-10 minutes for smaller cookies and 12-13 minutes for the jumbo, flipping tray around 180° half way through. Garnish with flakey sea salt and allow the cookies to cool completely on the trays (sugar alcohols can take a few hours to crisp up, so don't despair!). Store in an airtight container for three to four days. *Please see section on Flours for deets and possible substitution. **Please see section on Sweeteners for deets and possible substitution. Note that the shaped dough can be frozen for up to 3 months, and they can be baked straight from the freezer (adding 2-3 minutes more to the baking time). Please note that nutrition facts were estimated with Lily's dark chocolate or dark chocolate chips. But heads up that values can vary widely depending on what you use! I’ve tried a lot of keto cookies. once. because they just made me miss real cookies. but THESE are AWESOME!! I’ve made them twice now. i use the arrowroot version with no salt on top. first time I used half ‘n half powdered xylitol and erythritol because that’s my go to. 2nd time I tried all powdered erythritol plus a tsp of Truvia added at the end because I felt the Lindt 90% chocolate I used needed it. PERFECT! I was nearly in tears. it’s been 2years since I had decent baking before becoming T2. Can’t thank you enough! How about putting this into a no churn ice cream? I can barely leave it alone in the fridge! Lulu how awesome to hear you enjoyed them so much! And thanks for including your deets on the sweeteners in detail, always super helpful! 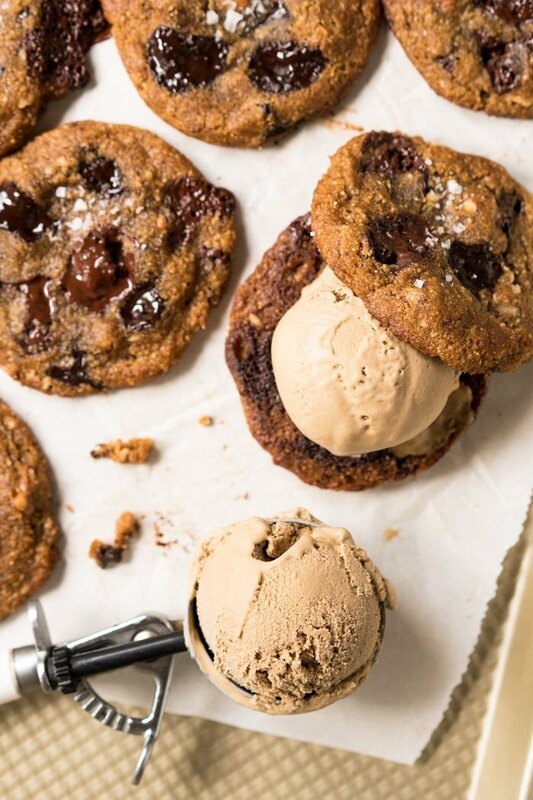 AND YES on the ice cream sandwiches… soooooooo good! xo!! Removing the coconut flour will DEF change the texture… they’ll become shortbread 😉 xo! I’ve come to the conclusion that I just don’t like coconut. Even in this small amount, I am tasting the coconut flour and it’s ruining an otherwise great cookie for me. Has anyone come up with an alternative to the 16g of coconut flour? Thanks! These cookies were the best. I did not have Xanthan gum nor blackstrap molasses and did not include pecans due to my son-laws allergy. Excellent just excellent. I raised the temperature by 10 degrees because I prefer my cookies crisper and left them on the counter to completely cool. My fiancee and I each had one and I had to hid the rest. Thank you for a most detailed recipe and looking to try many more. I have made these cookies twice according to the recipe except leaving out the xanthan gum and replacing it with grass-fed gelatin (2 tsp). They look just like Paola’s photos and taste great. I always use weights (grams) when I bake and am wondering if those who got poor results did not weigh ingredients. I use Lakanto Golden as my sweetener and Honeyville or Wellbee’s blanched almond flour plus 1 Tbsp arrowroot. For the chocolate, I used a mixture of Lilly’s dark chocolate chips and chopped 50% cocoa Choc Zero bars. I scoop them out after several hours in the fridge and flatten them slightly before baking. I top with Maldon sea salt flakes prior to baking. I was thinking of subbing with the gelatin as well. Looking for that crispy but chewy center texture. What differences did you notice with the substitution? My cookies turned out crispy at the edges and chewy in the middle. I also used an extra tablespoon of coconut flour instead of konjac powder. Forgot to add that creaming the butter and erythritol (I use Lakanto Golden) for 10 minutes in an electric mixer seems excessive. I only cream them until they are well incorporated and fluffy, no more than 2-3 minutes. I followed this recipe to the letter three times (just in case I messed up) but they never turn out anything like the picture. The first time it was way too cakey and salty. The 2nd time I cut back on the salt and molasses and left out the egg – came out crispy and tasted better but still nothing like the picture. 3 time left out some salt and put the egg back in – came out way to cakey again! Not sure what I’m doing wrong here – using all the ingredients as listed – no substitutions but leaving out the egg seems to make it crispy. How much (or little) are you flattening them out? Maybe it’s not quite enough. For me, they come out exactly like a homemade Toll House recipe (soft and chewy), but that’s exactly how I prefer them! I only flatten just a little. I don’t salt at the end nor do I use molasses. These are amazing, I was really struggling with needing a carb snack, well!!! I have to say mine over spilled slightly and the edges burnt, but I feel this is more trial and error on the size I make them before they go in, but TASTE wow ! Very well done ! Can Brown Swerve be Used instead of Lakanto? Thank You!! Worth the work (14 ingredients)!!! I have lost 37 lbs so far, while eating dessert, in moderation, every day. These cookies are delicious! I used a 100% cacao bar for the chocolate. I’ve learned recently that I don’t tolerate dairy well. Is it possible to sub the butter for coconut oil, butter-flavored coconut oil, shortening, or some other oil/fat? I was wondering if you have ever experimented with grass-fed gelatin in place of xanthan gum? I am going to try these with gelatin. From my research, I see that it should be a 2-1 ratio, ie, 2 tsp gelatin to 1 tsp xanthan gum. Will report back with results. I have been doing Keto for almost a year now and LOVE all you recipes!! You keep me going!! 🙂 My husband has decided to join me but he is allergic to almonds and most other nuts! I want to make him all your yummy cookies and garlic knots & cheese biscuits (he loves bread). 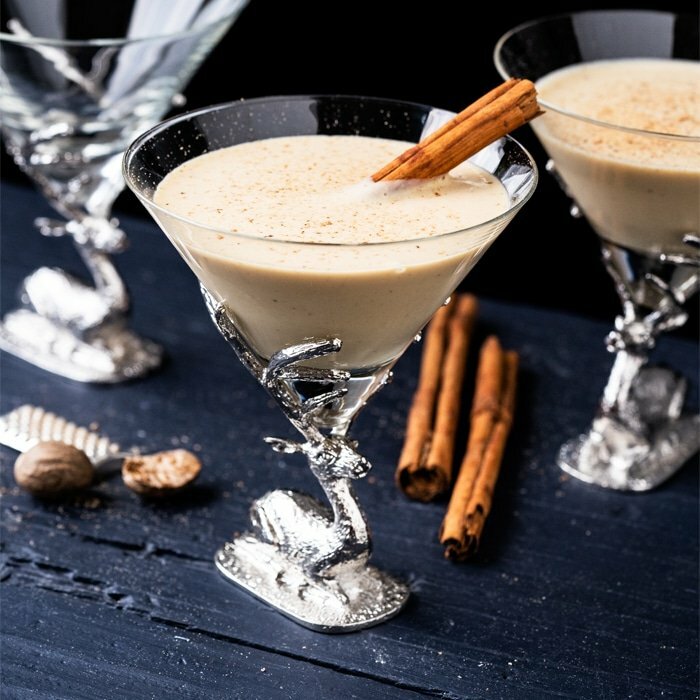 How can I do these with coconut flour? I’m so disappointed and hoping someone can help… I made these last night & followed the recipe exactly. I used Lakanto sugar. But the cookies didn’t turn out anything like the picture — they’re cakey — almost shortbready. Any ideas? I followed the recipe exactly except that I didn’t have konjac powder so I added more coconut flour. Mine turned out really crumbly, sort of like a short bread cookie. I’m not sure what I did wrong. I baked them for 10 min and they were barely golden brown at the bottom. Could it be because I used splenda? I am food prepping for when the baby is due. Can I make a big batch of dough and put it in the deep freezer? If yes, how long can it stay in the deep freezer? Congrats on the baby Vanellope! Generally cookies keep well frozen for roughly 3 months xo! Hi! Loved this recipe and it tastes amazing. However, my cookies never got the crispy. I used sukrin gold and classic lakanto because that was all I had. Not sure why they never crisped up. With the last batch, I used half pecans, half walnuts (because I didn’t have enough pecans for my liking). Well, I ended up with a bite of plain cookie and a walnut (no chocolate) and had a thought that this recipe might make an amazing banana nut cookie! I subbed the vanilla extract for 1.5 teaspoons of banana extract and used about 190g of walnuts instead of chocolate chips and pecans. I left everything else the same. So here I am… waiting for the dough to sit in the fridge for an hour. The dough, though, tasted SOOOO good!! I literally can’t wait to get some cookies in the oven! OMGEEE that sounds epic Sara! I just discovered banana extract a few weeks ago (and I used to make banana cookies all the time pre-keto!) can’t wait to try your suggestions!! xo! It worked! Oh my goodness — they turned out so tasty! I ran some of the cookies over to my mom earlier, and her picky self even approved! Definitely give them a try, and please let me know what you think! Hi, I am dying to get off work and go make these. I was wondering if the regular Lakanto sweetner will work or Sukrin gold? Those are the ones I have at home. Don’t have Lakanto golden. THey’ll both work (just expect a lighter color on your cookies with regular Lakanto if you don’t add the touch of molasses) xo! Hi Paola, made these cookies and everyone loved them! I do love most of your recipes. I do however am so confused about your nutritional value. When I entered the ingredients into my diet app it calculates 10g of net carbs per cookie. Can you help me understand why there is such a big difference? I have found that this happens with some other your other recipes as well. How do you calculate your nutritional value for your recipes? Is the cookies tastes a bit tingling cool? I’m not sure if perhaps I should grind the erythritol? I used hand mixer 8 mins and it’s still has the granules texture? So I wonder if that’s the case what made it has cool after taste. 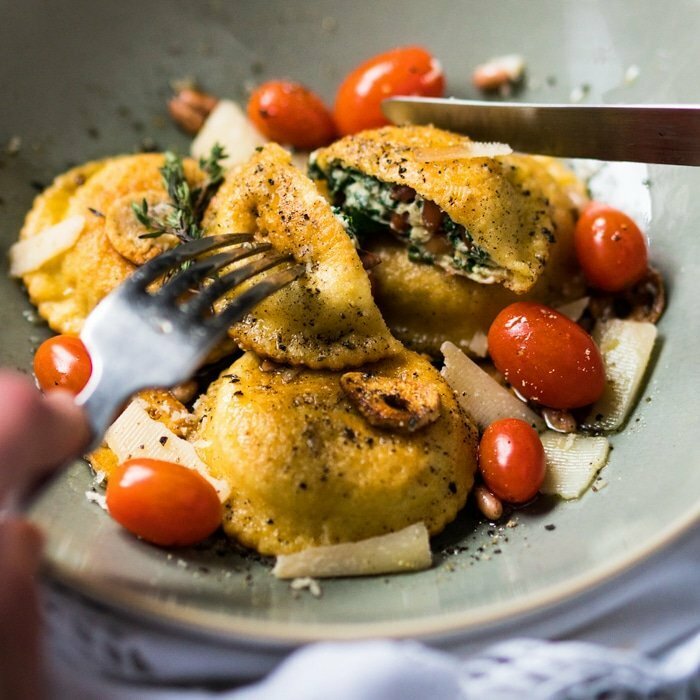 I’m really looking forward to your recipes calling for lupin flour since is a cheap and very accessible flour here in my country ! Hey paola my cookies turned out soft and not chewy kinda crumbly and soft with a soggy feel. I used Lakanto‘s and everything in the recipe exactly! Pre flattened them as well. Any idea what i did wrong? I am so dying for crispy cookies!! i waited over a day! still the same texture…no idea what i messed up on! Hi! After baking how long can these be stored in the fridge or freezer for? 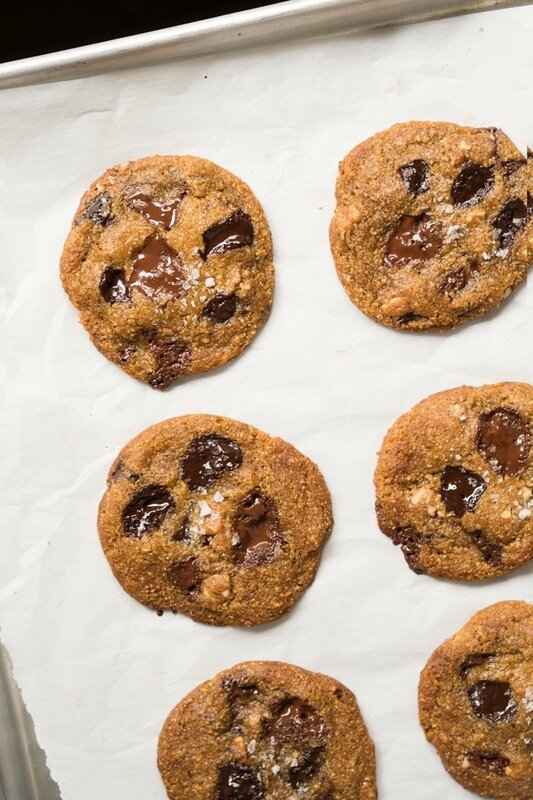 Tonight, I’m making a double batch of these cookies. That’s how good they are. Thanks Paola! Seriously the best cookies i’ve tried. Sooo good. I didn’t have xanthan so i just used more konjac. Love the nuts and texture and just wow. Speaking of experimentation relative to above previous posts, the aforementioned ‘cornbread’ dressing I made included 1/4 cup of konjac in place of oat fiber (which could not be found locally for love nor money, and there was no time to order any). There was substantial liquid involved, so I went for it. I can report that it worked beautifully in the recipe and neither I nor anyone else who ate it reported any sort of intestinal disturbance whatsoever. So using it in larger quantities seems perfectly workable. Same amount! Just keep in mind that your cookies will be super fragile for hours (you’ll know what I mean!) xo! This recipe is the bomb. Even my non keto friends love it. I’ve made it three times. The first time they turned out puffy, the way I love them! I only used 7 tbsp of swerve sweeter as well. I pre balled the dough before refrigerating too. The second time, I put a little extra butter in as it’s hard to measure that exact amount of butter. Lol. I also flattened them a little more. I refrigerated the dough in the mixing bowl. This time I used 9 tbsp of swerve sweeter, but we found them too sweet. They flattened right out in the oven which is not my favorite. The third time, I added 8 tbsp of swerve sweeter, and this was just right! I also pre balled the dough prior to refrigerating. I like them on the smaller side so I did two dozen balls of dough. I baked them for 12 minutes and they turned out amazing and were the best yet! I love this recipe so much and will continue to use it. I also throw in a handful of shredded, unsweetened coconut. I know this changes the macros slightly, but I’m alright with that! The four men I was feeding really indulged in this delicious treat!